This exhibition will be on view until December 11, 2010. Were the art world to hand out morbid superlatives, Peter Sacks would be a frontrunner for “best abstract elegy” or “most likely to haunt us with intricate renderings.” Sacks, an expatriate from South Africa living in Massachusetts, paints topographically dense works that raise questions about cultural history, the act of painting itself and the place of art in contemporary life. 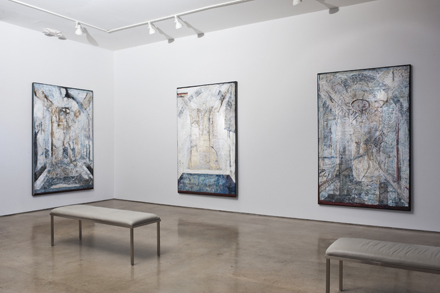 Peter Sacks: Recent Paintings on display at Wade Wilson Art features fourteen large paintings made of found objects—lace, netting, cardboard—applied to canvas, which is painted over until flat. In many of the paintings, the dominant shape is an article of scorched clothing that unravels to reveal rough textures and words behind loose threads. 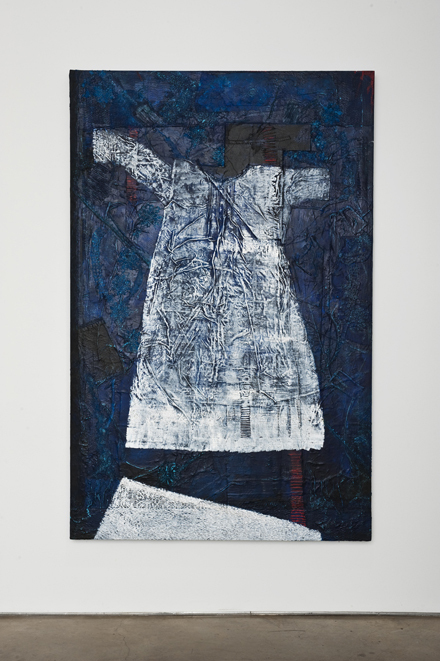 In Summoning 23, for example, Sacks paints a heavy, blue texture over the edges of a central antique white robe and across the background. Towards the bottom Sacks adds a red trapezoid; the effect makes it seem like the white robe is suspended in a violent blue atmosphere, levitating above a blood-red ground. Upon closer inspection, viewers can read the text of Black Hawk’s “Dedication to General Atkinson” (1833). The paintings become, in a sense, a person-less portrait that illuminates the complex dynamic between world history and intimacy. The speaker’s eye for detail is astounding as he deconstructs and recreates the dead; equally affecting is the ease with which the speaker renders his father into a ghostly realm. Like the speaker in Natal Command, the viewer of Sacks’ recent paintings is haunted by a transformative encounter as the painting allows varying degrees of scrutiny. From across the room, the painting speaks of scale, color and abstraction. As the viewer approaches, he or she can discern more detail, can suss out the materials applied to the canvas, and then, when confronting the painting face-to-face, the viewer can read typed or handwritten words (“sacrifice,” “ammunition”). The paintings often include fragments of text that range from Robert F. Scott’s journals from the fatal South Pole expedition of 1912 to Rilke’s Duino Elegies (1912–22). Some of these texts are dutifully copied across the canvas by the artist’s own hand, while others are typed on scrolls of cloth and sealed with paint across the heavy impasto. Sacks does not use text merely as a design element; he draws inspiration from the words and plays upon their oblique historical connections. Rebecca Wadlinger is a doctoral candidate in literature and creative writing at the University of Houston.